- Advanced and flexible: Using just two interchangeable wires that carry both data and power. - Simple 3-wire: Diode-mixing networks with separate power and communication wires. This section introduces the hardware design. It presents the main aspects of selecting and refining the design of the proper hardware based on the choice between the beforementioned network implementations. For all technical details please refer to SerialPower Architecture PDF document. - The simplest possible networking method: two wires (without polarization), implying a very cheap solution. Even an old-fashioned existing wire pair (for example a telephone wire in a house) may be used. - Extreme flexibility in modular design of applications is possible since the interface is physically simple and does not have a polarization. This means that simple contacts are possible in many ways as an integrated part of the product's physical design, for example using simple plugs, simple contacts using magnets, springs etc. etc..
- The network can be easily incorporated as part of modular, 3D-printed designs. - Power can be managed at one single point, so no batteries at local modules need to be monitored or replaced since nodes need a back-up capacitor only. Still, a battery can be used in case of a power-hungry node. - Preferrably use twisted-pair cable in order to minimize interference due to EM-noise. - The electrical design becomes more complex as compared to the simple three-wire solution due to the power+data interface circuit. - The power+data interface circuit leads to a lower effective Vcc at the nodes, the node's electrical design needs to accomodate that. The electrical circuits that correspond to this solution are presented here. Please consult the SerialPower Architecture PDF document for details. In case the polarization of the two-wire connection is known (i.e. which wire is connected to the ground line of the Master node), it is possible to considerably simplify the data+power interface of the slave node, as shown here below. An added advantage is that the effective Vcc of the slave node is higher than that of the nonpolarized slave node. - Extremely simple circuit design, requiring only one resistor and diode at the slave node side. 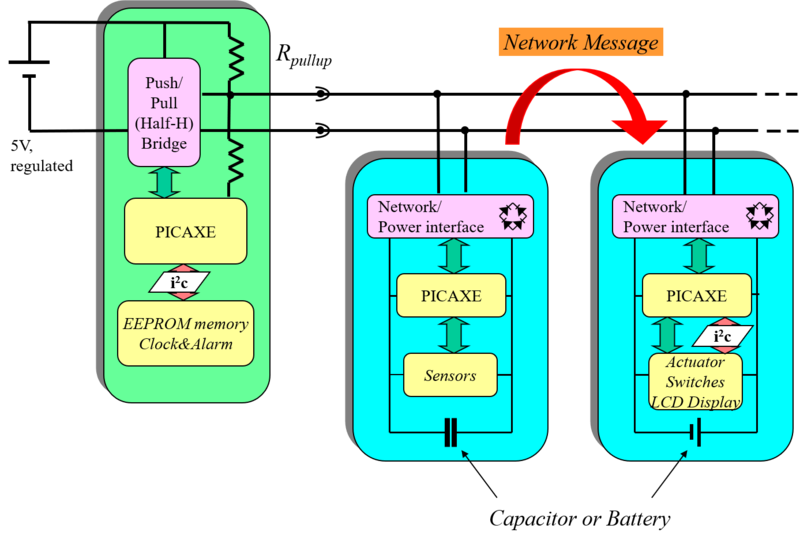 Its simplicity implies ease of implementation and testing and low chance of hardware-related errors. - Perfect for simple prototypeing hardware when developing SerialPower software applications. - Due to polarized three-wire connection a physical interface between nodes/modules will require a static, physical connector with three contacts. - Cable shielding for EM-induced moise is more involved than the shielding approach of the two-wire network cable (like twisted-pair). The electrical circuit that correspond to a three-wire network comprising both Master node and Slave nodes are presented here. Please consult the SerialPower Architecture PDF document for details.